Home » Our Doctors » Shawn M. Prapta, O.D. 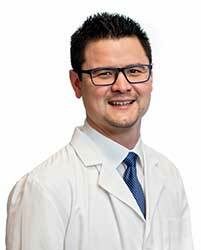 From an early age Dr. Shawn Prapta knew his dream was to become a doctor. Born and raised in Houston, TX, he received his high school diploma in only 3 years. Shawn enrolled at UT-Arlington where in 2007 he graduated with a Bachelor of Science degree in Biology. While at UTA, Shawn participated in the pre-Optometry program and worked at several Optometric practices, including TSO Mansfield, before beginning his Doctoral program. While in Optometry school he was a class leader and liaison for his fellow colleagues. Shawn’s last year of clinical training was focused on ocular disease and pathology. In May, 2012, he was awarded a Doctor of Optometry degree from the University Of Houston College Of Optometry. Immediately upon graduation, Dr. Prapta joined Dr. Cameron Smith at TSO Mansfield as a full time associate Doctor. Dr. Prapta is a licensed Therapeutic Optometrist and Optometric Glaucoma Specialist. His main interests involve managing diabetes in the eyes, foreign body removals, and treating ocular infections. He has also received extensive ocular training in cataract and Lasik co-management. Dr. Prapta has been a guest speaker for the Tarrant County Diabetes collaboration where he presented on diabetes and its effects on the eyes. He is a member of the American Optometric Association, Texas Optometric Association, and the Tarrant County Optometric Society. He and his wife Judy reside in Mansfield, and share their home with their 2 squirrel chasing canines and a couple of furry felines. Growing up, Shawn played competitive ice hockey and traveled all around the United States for tournaments. You can still find him playing hockey on Thursday evenings at the Parks Mall in Arlington. When not keeping cool on the ice, he enjoys attending Rangers and Cowboys games with his family.